This product is regulated by the Consumer Product Safety Commission and is not required to have ingredients listed on the label. Measure desired amount of base and place in container with pour spout. Add fragrance at 1%. Stir gently but completely to incorporate fragrance. Pour into bottles. Cap and label as desired. COMMENTS: Wonderful for freshing you pet’s coat between baths. I use the deodorizing fragrances and my customers love it! COMMENTS: Super easy to use. Customers love it. COMMENTS: SO FAR SO GOOD....MY CUSTOMERS LOVE THIS SPRAY BASE I USE WITH A LITTLE ARGAN OIL FOR THE PET COATS AND THE FELL IN LOVE. COMMENTS: Was very easy to create pet products with. Definitely be buying more. COMMENTS: Really love this product we have great dane's & they hate getting baths so in between baths we use the pet refreshing spray it works so well the dogs love it because the only get baths once a month & we love it because they smell so great & there coats look & feel soft & shiny!!! Truly a great product if you have pets you really need this product!!!! "My Dog loves his tranquil sleep bed spray"
COMMENTS: Customers love this spray. It hold fragrances very well. It conditions & freshens. I am very glad I found this to go with the pet shampoo. COMMENTS: What a great product. Takes fragrance very well. I added the dog days fragrance from WSP and these flew off the shelves. I completely sold out in less than 15 minutes. I have already reordered. If you haven’t tried this product I encourage you to you will not regret this purchase. Thanks WSP! COMMENTS: great on pets. Just wish the ingredients were shown. I don't care that they don't HAVE to be shown. My customers would like to know what is going on their pets. COMMENTS: Thank you WSP for another wonderful product! Very easy to incorporate essential oils and fragrances! Just wish they would be able to list the ingredients but other than that great great product!!! COMMENTS: Perfect! My customers love this product! COMMENTS: It seems quite bubbly upon spraying on my maltese's coat but it does leave his hair soft when dry. COMMENTS: I've had a wonderful response from my customers who have purchased based my pet spray products. I use the product myself on our springer spaniel. The spray is gentle on her coat and freshens nicely between baths. "a very nice pet base spray"
COMMENTS: A very nice pet base spray. Holds scent very well. Non irritating. Excellent. COMMENTS: This has become one of my best products. I love it. COMMENTS: I sell out of this spray every time I make it. I use Rosemary Mint Essential Oils and the dog people go crazy for it. Really nice doggie spray!! • Works great on dogs! "Lula Blue Stinky Dog Spritzer"
COMMENTS: I use this base with essential oils and E.O. modifier to make my Lula Blue Stinky Dog Spritzer and it works like a charm! I use it between baths and after hiking to freshen and clean my fur baby's coats. I have also used it to freshen their bedding and to cleanse minor scratches the dog have gotten while running through the woods. I wouldn't do that unless the scent is coming from essential oils and not fragrance oils. I have had clients tell me they like the convenience of having a spray-on cleaner for in-between pet baths. • I love the convenience of this product. COMMENTS: I can't keep Pet Spray in stock. Everyone loves this! COMMENTS: So easy to use and with the WSP Eo/FO Modifier Fo and EO are so easy to add to this product. COMMENTS: this is a great product. it detangles, softens, and deodorizes my dogs fur and she doesnt even have dry skin anymore. when they say some dogs are sensitive to fragrance they really mean it, which is why i make a few unscented bottles for customers along with the scented ones. love this stuff! "Wonderful base to work with. " COMMENTS: It only takes a little bit of F.O. for this spray to make it smell good. So far I have had no complaints and I use it on my dog who has dry sensitive skin and she does good with it. COMMENTS: I really like this pet spray and so do my customers! It has a great scent too! COMMENTS: I purchased the pet spray base and added some fragrance. Our groomer loved the idea of using a handmade item. Our little dog smells wonderful! COMMENTS: This is the only Pet Spray I will use for my products. My clients love it, works great, holds scent very very well! "Can this spray be sprayed through a fine mister?" Staff Answer Yes it can. 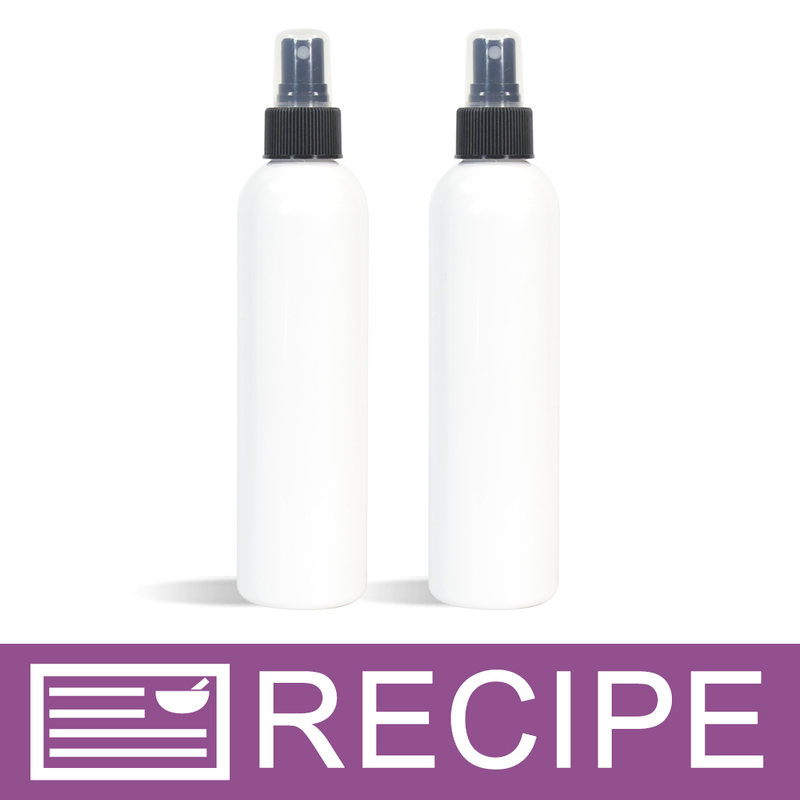 We use our sprayer tops in all of our pet spray recipes. 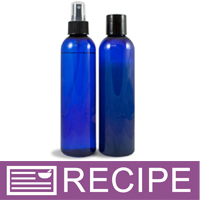 "What are the product labelling requirements if I am adding essential oils or frangrances to this base to make dog fragrances? If I am using this as a base do I only need to list the fragrances used?" Staff Answer Pet products are not required to have ingredients listed so it is up to you if you would like to list the essential oils used in your product. "Are there any fragrances you can suggest for this?" 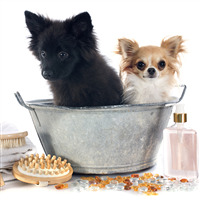 I have used the Agave Nectar Odor Neutralizing Fragrance Oil in my pet shampoo and it smells wonderful and really does help keep the order away so I am going to try it in the pet spray. Rose Gernium EO is a very good oil to add because it will help keep ticks away from your dog. Either a few drops on the collar or mix with pet spray and spray on your dog, especially their feet and legs. If you rub the oil on yourself, it will also keep ticks away from you. Plus, it just smells good! I would suggest the Baby Powder Fragrance, I had purchased multiple pet sprays retail with this as a fragrance as well. Applied after grooming and it is a fantastic compliment! "After reading the MSDS sheet entirely; why can't we be provided the ingredients if requested? I understand it is not required, but being required and customers wanting to know are two different things. We should have the choice as to if we want to list them or not, and I'd like to be as transparent as possible before purchasing to make up many of these." Staff Answer The Pampering Pet Spray is not regulated by the FDA and therefore our supplier is not required to us the ingredients list. Since we are not given the ingredients list we are unable to pass that information on to you. "how do I list the ingredients on this for sale? " This product is regulated by the Consumer Product Safety Commission and therefore you are not required to have ingredients listed on the label. "Can you point me to where I can find the IFRA Guidelines for each Fragrance Oil as far as pet products? I am only seeing body lotion, face cream, perfume, body wash, body powder, deodorant, soap, baby and lip when I look at a specific fragrance oil." Staff Answer Hi Janene - We currently do not have IFRA information for pet products on our website, but we would be happy to look it up for you. When you find a fragrance you need to know the IFRA, simply ask the question on the product, and we will respond back. Thanks! "Is it required to add a preservative to this? What is the recommended shelf life? " Staff Answer You do not need to add a preservative to this base unless you introduce water. We guarantee all of our products for one year from date of purchase. "Hi, can we added hydrols to this pet spray? If so, how much and if preservatives is needed? Thank you." Staff Answer Yes you can. Preservatives all have different usage rates. You will need to follow the guidelines for the preservative of your choice. The amount of preservative would be based on the amount of Hydrosol added. "Is it possible to to add essential oils to this spray for flea control? If so what oils do you recommend?" You can make this product anyway you would like as long as it with in the recommended amounts to add. Some flea control EO are Eucalyptus, tea tree, lemongrass, pine, lavender keep in mind some oils are not good for some dogs and some cats and do your research before adding anything. "Is there a safe fragrance to use with this? Regular fragrance oils aren't okay to use in lip balms so they probably wouldn't be good for amimals to lick." Staff Answer There are safe Fragrances for our Pet Products. Under the IFRA Guidelines for each Fragrance Oil it lists what percentage of that particular fragrance is safe in pet products. "Will I have to use a fragrance oil stabilizer with this product? " Staff Answer Good question. The directions for this product is to measure out the amount, and add fragrance at 1% and stir. The directions do not stipulate that you need a stabilizer. We do not have an ingredient list and this product is not regulated by the FDA therefore, the manufacturer is not legally required to give us the ingredients. "I've never used a pet spray before, where is the best spot on your animal to do a "test" to make sure they will not have a reaction to it? I rather do a test area before I spray her down." Staff Answer We do not have a recommendation as every animal is different. They may or may not have a reaction to the spray. So it is up to you as to where you would like to test it. The spray is for animals and safe for them. I would avoid spraying it in the face area. As you would with spraying perfume on yourself. "Is this product for both dogs and cats?" Staff Answer Yes, this product can be used for all pets. Cats, dogs, any pet, really. It's just a spray that makes it smell better than animal sweat. You can even use this on their rug and litter boxes! "Is there a recommended amount to be used on your pet?" "Does this do anything for your pet besides scenting him or her, such as conditioning the fur, etc...?" "Can you identify the ingredients in the Pampering Pet Spray? I understand that there is no requirement to list the ingredients on the packaging, tbut I would like to know what is in it before using it on my pets, and I suspect my customers would as well." Staff Answer This product is not regulated by the FDA therefore, the manufacturer is not legally required to give us the ingredients. We do not have the ingredient list.